Designed to amaze, the Arden Bar Stool Tweed Fabric is a modern spectacle that fuses pure style with functionality. Ideally suited to modern kitchens, the Arden has a sophisticated aesthetic that will also work to update bar areas with a more classic look. The seat boasts chic tweed fabric upholstery, which covers dense padding for optimum comfort. 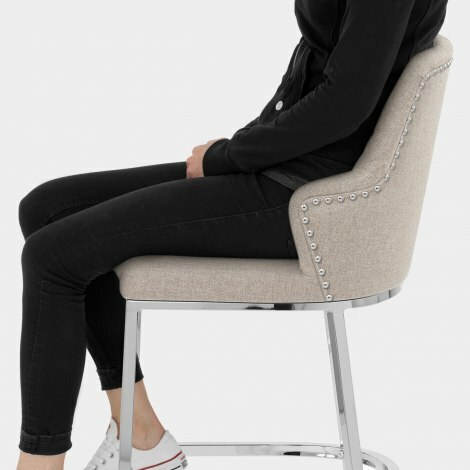 Small wings accompany the tall backrest and lend a secure surrounding feel without compromising on space. The back also features a diamond stitch design on the front and metallic stud edging on the rear. Fixed at standard kitchen worktop height, the frame has four legs and bracing bars that form a footrest, all of which is finished in mirrored chrome. Protective plugs are integrated beneath the legs in an effort to take care of floors. 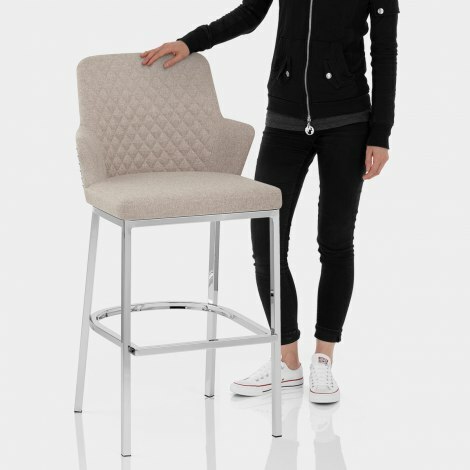 "Colour is very natural and they look very expensive"
These bar stools are extremely comfortable the colour is very natural and they look very expensive, I would highly recommend.